Albrecht Durer (21 May 1471 – 6 April 1528) was a German painter, printmaker and theorist from Nuremberg. His prints established his reputation across Europe when he was still in his twenties, and he has been conventionally regarded as the greatest artist of the Northern Renaissance ever since. He was in communication with the major Italian artists of his time, including Raphael, Giovanni Bellini and Leonardo da Vinci, and from 1512 he was patronized by emperor Maximilian I. His well-known works include the Apocalypse woodcuts, Knight, Death, and the Devil (1513), Saint Jerome in his Study (1514) and Melencolia I (1514), which has been the subject of extensive analysis and interpretation. His watercolours mark him as one of the first European landscape artists, while his ambitious woodcuts revolutionized the potential of that medium. Dürer’s introduction of classical motifs into Northern art, through his knowledge of Italian artists and German humanists, have secured his reputation as one of the most important figures of the Northern Renaissance. This is reinforced by his theoretical treatise which involve principles of mathematics, perspective and ideal proportions. 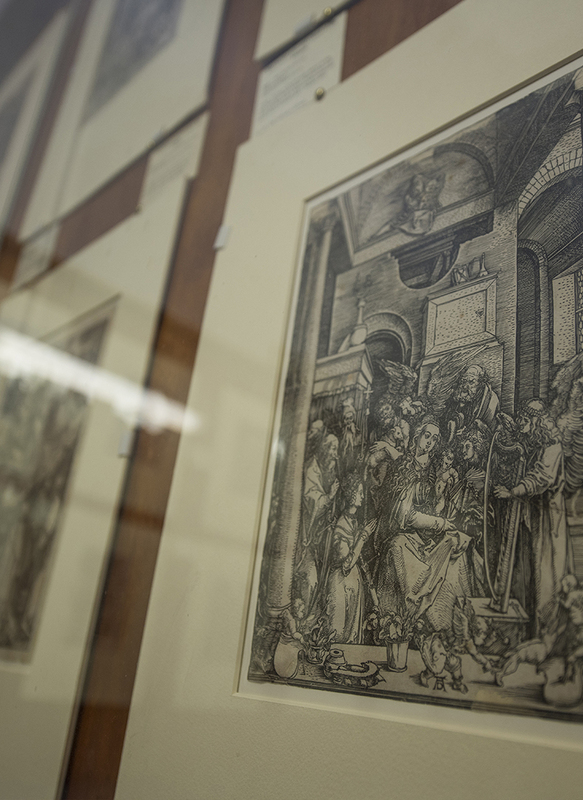 The Durer hall is one of the most important spaces in the Museum, as it contains original Durer engravings. This collection is one of the largest outside Germany, and is comparable to the Royal Collection found inside Windsor Castle. This collection includes the whole set of ‘The Life of the Virgin’ on wood cuts, as well as the whole collection of The Small Passion on copper plates. The signature AD is to be noticed on these engravings witnessing authorship of one of the greatest Renaissance artists. Other miscellaneous original engravings depicts: ‘St. Jerome in His Cell’, ‘St. Christopher’, and ‘The Virgin and Child with the Monkey’ to mention some. 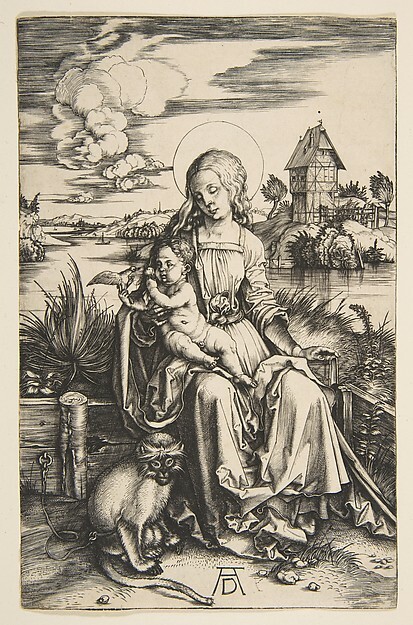 A distinctive feature of Dürer’s small-scale devotional images of the Virgin and Child is their repeatedly referred to ‘life-likeness’, all the more apparent for the seeming lack of dogmatic religious attributes. Mary is predominantly shown seated outdoors on a bench, rarely ever on a throne, and never without the Christ Child. In contrast to earlier depictions Mary is dressed in contemporary clothes and placed in the midst of a distinctly northern landscape setting. An Italian engraver, known for being the first important printmaker whose body of work consists largely of prints copying paintings. He is therefore a key figure in the rise of the reproductive print. He also systematized a technique of engraving that became dominant in Italy and elsewhere. His collaboration with Raphael greatly helped his career, and he continued to exploit Raphael’s works after the painter’s death in 1520, playing a large part in spreading High Renaissance styles across Europe. Count Saverio Marchese enjoyed great respect as a connoisseur and a cognizant. His expertise extended over a number of fields, among them poetry , history, archeology, the Maltese language and especially the local arts and art history. He amassed a substantial collection of paintings, drawings and prints, many of which he left to the Mdina Cathedral Museum. Of all the old collectors Saverio Marchese was one of the earliest, to have left his collection of paintings, drawings, prints and art books as a legacy to a public institution — the Cathedral Church.